Welcome to Week 7, it is shaping up to be a busy one! The Little Mermaid Musical - Rehearsals are going well and the kids are feeling really comfortable. It has been great to see them getting the chance to try their costumes on and practice with the microphones. There is a few colds, sore throats and coughs going around at the moment so if your child is unwell please keep them home for a day or two to help them to be at their best for next week! Father's Day Breakfast - Is on this Friday morning, 1st September. Please make sure that you have RSVP'd . They are still calling for helpers if you can spare the time. Shoebox Appeal - Just a reminder that you need to send in a personal hygiene item, something special (small teddy etc.) and $2.50 as soon as possible. Welcome back to Week 6, it was lovely to get a little bit of sunshine yesterday and this morning! Please note students are expected to wear their full winter uniform (including their jumper) on both Thursday and Friday and to make sure they are neatly groomed for each day. Can I ask that you please pay particular attention to getting hair cuts as needed and that shoes get an extra polish this week. General Dress Standard - Just a gentle reminder that students should be wearing predominantly white sneakers on our sports days as per our current uniform policy. Coloured sneakers and skate shoes are not to be worn. I have had a request for some assistance from Sheila Shannon who is the President of our local St Vincent de Paul branch. She is wondering if it would be possible if there may be some students willing to assist with the "Bingo and Afternoon" fundraising event she is hoping to hold on Saturday, 4th November? Mrs Shannon has booked the old Dunsborough Hall for the event, and is hoping that some of the students and/or parents may be willing or able to help in some way such as donating any prizes or helping to bake or serve food. If you or your child is able to help, please get in touch with Sheila directly on sheilacatherineshannon@gmail.com and let her know how you are able to help support this event. Welcome to a windy Week 5! Mission Markets -Feast of the Assumption - Tuesday marks our school feast day and the Assumption of Mary. This is a day dedicated to Mary our Mother and to celebrating our school. The morning will begin with a whole school mass (parishioners will also attend) in the hall at 9.00am. This will conducted by visiting priest Fr. John Finlayson. Please make sure that your child brings their spending money in a sealed bag or wallet/purse in smaller coin denominations. Please send in your donation of 2 bags of chocolates or wrapped lollies with your child tomorrow if you have not already done so. 11.25 - 11.45Kindy & Pre-Primary students to visit markets on their own with Year 6 assistance. 11.45 - 12.45Mission Markets. Apologies for the delay in posting this week...I picked up this cold that has been floating around...get well soon wishes to those of you that also have it! A very big thank you to you all for presenting your children so well on Saturday night, they all looked amazing and engaged and participated in the mass so well. I was incredibly proud of them! 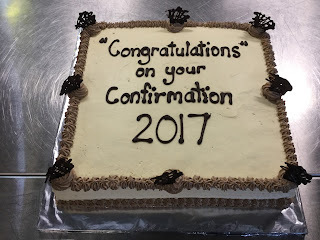 Confirmation Certificates & Morning Tea - this Friday at Assembly we will be presenting the students with their certificates from Confirmation - prayer buddies as well. If you can join us it would be great to see you! We will also be having coffee and cake afterwards and we would love it if you could join us for that to celebrate such a special night.